Create your own video games! Most everything can be done with just the free app, but most kids seem to really enjoy the physical gamekit. 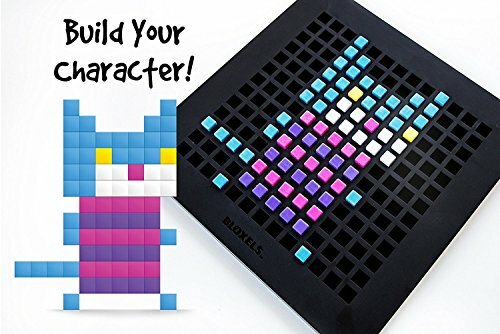 Craft your own video games with either the gameboard and cube kit, or do it all in the free app, Bloxel Builder. A number of people have said that they think the game kit is a rip-off, but we disagree. Pressing buttons on a tablet just isn’t the same thing as physically moving around the cubes to change up design elements. With that said, go ahead and download the app to see if this is something the kid in question would enjoy over the long term. It takes some time to really get the hang of using the app. There’s a lot of buttons and tabs to explore, but they’ll feel intuitive to those who have used artistic or creator types of apps before. The buttons use icons rather than words, making this a very popular set for classrooms with mixed languages or reading levels. The one real drawback to Bloxels is that it really needs a tablet or similar device. The app will work on smart phones but the screen will just be too small to really do anything. Tablets aren’t super cheap, so this may make the game cost prohibitive to some families. Bloxel Builder is a free app that allows for the creation of personalized video games. Everything from the layout to the background to the characters and enemies can be designed in pixelated glory. The kit is really only optional. It comes with a 13 X 13 gameboard which acts as the formatting tool for the game designs, but everything can actually be done within the free app. We like the kit because it gives a physical component to the creations, but we totally recommend downloading the app to see if this is something that will actually be enjoyed instead of just left on a shelf. 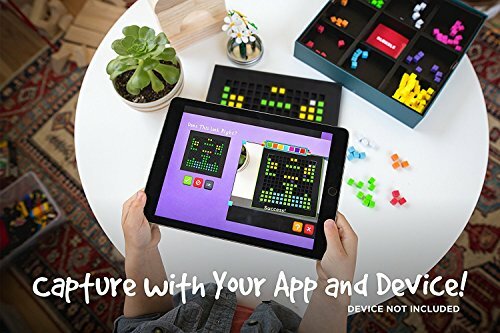 Use the app, Bloxel Builder, to design personalized video games. Create rooms, levels, and entire worlds filled with your own characters and enemies. Players start by placing down game elements, such as terrain, obstacles, coins, and power-ups. After some play-testing to make sure everything is in its place, players can get down to creating their own designs and animations. Everything can be done entirely from the app, though we think placing the little cubes onto the gameboard is a big part of the fun. Since the app a free download, there’s no reason not to try it out before getting the kit. Aside from creating designs, each cube colors are used to represent something in the video game. For instance, purple cubes indicate where an enemy will show up in the game. Once in the editor, the app will allow players to choose which type of enemy appears in that spot. Check out the HOW IT WORKS video for a full tutorial from the manufacturer. It’s long but so very helpful. 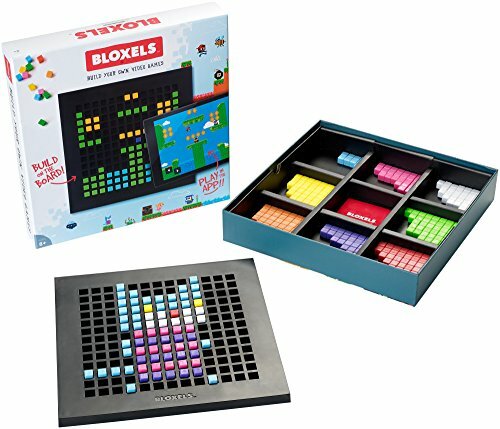 For the kid who really likes focusing on those creative details, Bloxels may end up becoming their new daily activity. 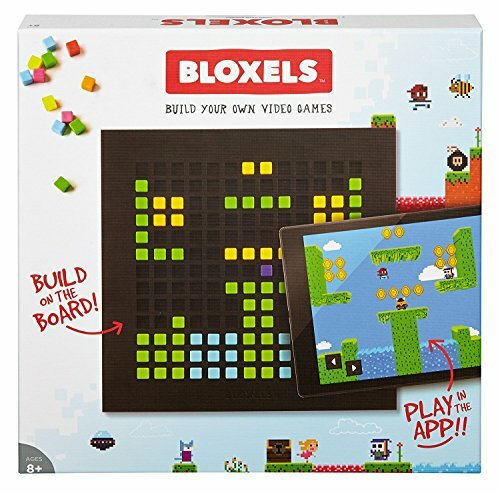 Build Super Mario Bros style video games to play with family and friends, or share with other Bloxel creators using the in-app Infinity Wall. Interestingly, the kit is not actually required for play. Most of the experience can be had just from the free app. Downloading the app gives access to the creation and animation of game terrain, characters, enemies, power-ups, and collectibles. Purchasing the kit allows for some of the more advanced game elements, such as giving a brain to control enemy behaviors and movements. 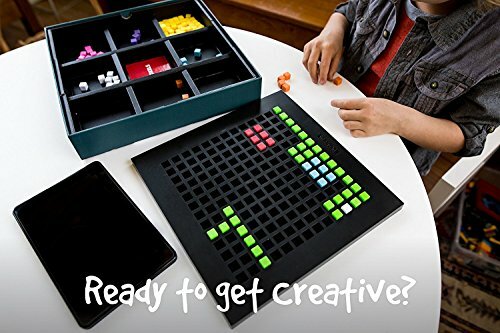 Though the kit isn’t necessary to make personalized games and characters, a number of users comment on the fun of just playing with the cubes. This tactile dimension of the game is simultaneously soothing and exciting for those who enjoy working with their hands. Having the gameboard also makes it easier to include siblings since there are effectively two workstations, one for design and one for editing. Place the gameboard on a solid, light-colored background. This creates a contrast that helps the camera find the gameboard. Avoid glare. Don’t have the gameboard on glass or other reflective surfaces. Strong lighting is key, so long as there is no glare from the cubes. Keep clutter out of the frame. Just the gameboard and a contrasting background work best. Most users found aiming the camera from directly above the gameboard didn’t work as well as aiming it from a little off to the side and with the camera tilted a bit. Even with these tips, there is still a chance the design won’t come up 100% correct. Editing can be done in-app, so if there’s just a few cubes mixed up, it’s likely easier to fix them there instead of trying to retake the picture. We found that the dark pink and purple cubes are often switched around, so make sure those are correct. 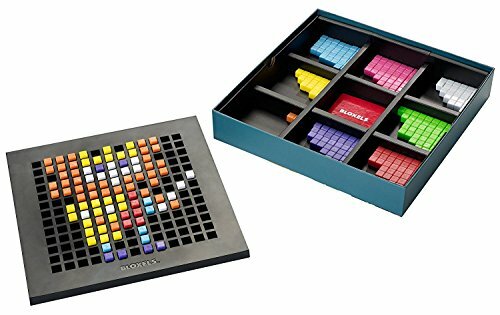 The 13 X 13 square gameboard is made of plastic similar to that used for LEGOs, and fits into most backpacks. An odd numbered square gives the board a central point, making it easy to build out from the center if desired. Recommended for kids 8 and up, we've seen 7 and 6 year olds enjoying themselves, though these are kids with more patience than their peers. Overall, we really enjoy this. It’s a great concept, and even with the wonky camera, we’ve watched kids and adults spend hours tweaking designs and trying new ways of making games challenging. Children must be 13 or older (or have a parent’s or guardian’s permission) to create an account in Bloxel Builder. This account is used to share and download other creator’s works. The kit only comes with 8 cube colors but the app has 64, so don't worry about feeling limited. The cubes are small enough to be a choking hazard for small children and pets, so be sure older kids know to keep up with all the pieces. 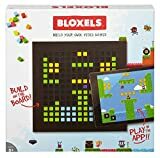 Bloxels® is an innovative video game development platform that allows you to create your own video games. With easy-to-use physical and digital tools, the imaginative gaming worlds of young gamers come to life in a cool retro arcade style. You decide what the game looks like and configure how it is played. You tell the story of the characters and design their looks. You create the obstacles and the power-ups. And then not only can you play, but you can share your game with fellow gamers for both game play and content remixing.